This story of hope has lessons for other people struggling to realize their rights to self-determination. Once you read this well organized and clear-as-a-bell account of Tibetans’ struggle to preserve their culture, religion and language, Tibet seems no longer remote, no longer isolated, no longer condemned to succumb to Chinese military and police control and cruelty. To encourage non-violence, Dorjee does not underestimate the difficulties, neither does he make false claims as to what might be achieved. He develops his enthusiasm for strategic thinking by unravelling the characteristics of the three Tibetan uprisings against the Chinese. He grounds his analysis in history. He teaches well because he has learned from the past. The first uprising, 1956-59, provoked to protect religion and the Dalai Lama from danger, was predominantly violent, spiralled into chaos and resulted in the deaths of 87,000 Tibetans. The second uprising, 1987-89, prompted to resist Chinese attacks on the Dalai Lama’s reputation, used far more non-violent tactics but was mostly confined to the capital Lhasa and to central Tibet. Almost certainly as a result of the non-violent resistance, there were far fewer casualties. By the time of the third uprising, in 2008, the influence of non-violent philosophy could be seen in efforts to publicize events in Tibet and in this way place international pressure on China. Activities across Tibet included a growing and apparently more confident non-cooperation movement. In this brief primer on Tibetan culture and history, beautifully illustrated with maps, it is possible to understand how commitment to non-violence has evolved. 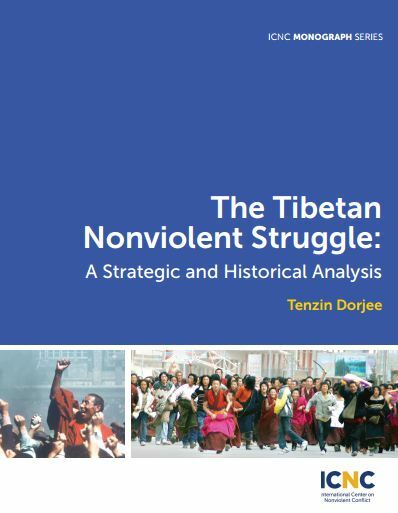 At first glance Buddhism would appear to have been the natural ally of non-violent tactics, but Dorjee shows that a preoccupation with the moral implications of Buddhism hindered political understanding and practical achievements. Theories about non-violent resistance were not well known across Tibet. However, three significant figures, Mahatma Gandhi, His Holiness the Dalai Lama and the American theorist of non-violence Gene Sharp influenced Tibetans’ understanding of alternative ways to resist Chinese repression. Mahatma Gandhi’s teachings about the connections between economic self-reliance and political independence were perceived as highly relevant to Tibetans’ need to overcome the fatalism that little could be done to oppose Chinese rule. From his exile in Dharamsala in India, and in his world travels, the Dalai Lama showed how, by addressing individual empowerment and by commitments to dialogue and peace, non-violence could be political yet stay consistent with Buddhism. In the 1990’s Gene Sharp’s work was translated into the Tibetan language. His methods ranged from public speeches to marching and music, from the crafting of pamphlets to the boycotts of goods and services, from religious processions to assemblies of protest. The three-fold division of these methods into strategies for Protest and Persuasion, for Non-Cooperation and for Non-Violent Intervention, gave Tibetan activists the ideological base for their own plans. The non-violent movement in Tibet is now characterized by strategies to liberate citizens from that colonized mind set which accepts repressive political measures as inevitable. That’s the hope. It’s also the promise of this impressive monograph. Professor Emeritus, Founder Sydney Peace Foundation. Co-founder Centre for Peace & Conflict Studies.